Tinker Town Tiger: Baby the Rain Must Fall. Baby the Rain Must Fall. I would like to express my gratitude and appreciation to the LSU Athletic Director, University President, and LSU Board of supervisors for finally making the change to the LSU College Football Program. Replacing Les Miles as Head Coach of the LSU Football Team with interim Coach Ed Orgeron Jr.
"It's apparent in evaluating the program through the first month of the season that a change has to be made," Alleva said in a released statement that he probably had saved in his phone to cut and paste. It's also probable that unlike last November when LSU made an unsuccessful run at Florida State coach Jimbo Fisher, Alexander and Alleva didn't fear being roasted by the national media. There will be plenty of name coaches wishing to replace Miles, because they know all the parts are in place to battle for national championships – outstanding in-state high school prospects, state-of-the-art facilities, one of the most storied game atmospheres in the nation and a rabid fan base thirsting for a new direction. Also, the fear from naysayers "firing a head coach will hurt recruiting" should be thrown in the garbage. If you hire the right coach playing an exciting brand of football, the recruits will be lining up. If you throw it, they will come. In the meantime, Orgeron and his revamped staff that includes tight ends coach Steve Ensminger moving to offensive coordinator, graduate assistant Eric Mateos hired as tight ends coach and Pete Jenkins being hired for a third tour of duty as LSU's defensive line coach, owe it to this team to salvage the season the best it can. 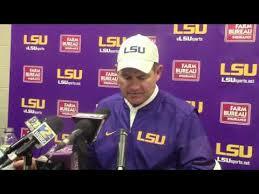 In his first team meeting Sunday, Orgeron brought a piece of rope that each team member had to touch. The message was clear: "We all have to pull together in the same direction to be successful." Now that Miles and Cameron are gone, the LSU fan base feels the same way. With more ropes and fewer drops, anything might be possible.